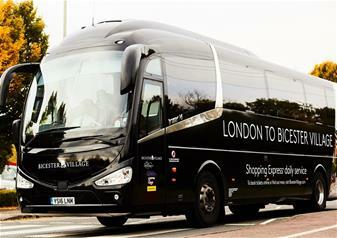 Enjoy a delightful trip to Bicester Village Shopping Centre on a return luxury coach from London. You can sit back and relax as you travel to Bicester, a beautiful town in Oxfordshire for the ultimate shopping experience! Take the stresses away by taking advantage of our return service with 3 pick-up points centrally located, ensuring you have a care-free, enjoyable trip to one of the world’s most premium shopping locations. After a short one hour trip from London, you’ll be in shopping heaven in the exquisite Oxfordshire countryside. You’ll have the chance to indulge yourself in some of the most famous brands in the world all in one place with fantastic discounts! Whether you’re looking for shoes in Jimmy Choo, jewellery in Links of London or clothing in Oscar de la Renta, you will be mesmerised by the leading fashion brands. After your shopping adventures, you can stop off for a bite to eat at one of the many food places on offer and enjoy 10% off many of them! Whether you want a small snack at Le Pain Quotidien or dinner at the Farmshop Restaurant, there are many delicious foods to fill your appetite. For the ultimate indulgence, make a visit to Snowflake Luxury Gelato or Creperie Angelie. With a recent expansion bringing you more than 30 gorgeous new boutiques, you will be spoilt for choice when you reach Bicester Village! Indulge in Acne, Joseph, Under Armour, Rapha, Bamford, Villeroy and Boch, plus many more. This autumn, you’ll also get to enjoy pop-up boutiques including the world-famous brand, Charlotte Tilbury! This exciting season also sees the new British Collective bringing you a gifting boutique by Luke Edward Hall, interior designer and illustrator. Here, you will be mesmerised by the beautiful offerings including accessories and lifestyle products. It’s not only boutiques that have expanded their presence – you’ll also get to stop off at the gorgeous Secret Garden Cafe restaurant. The perfect way to relax after some much-deserved retail therapy! Once you’ve finished exploring the shops, you can enjoy a relaxing journey back to London on a luxury coach. It’s the perfect way to end a perfect shopping experience! You will spend approximately 6 hours at Bicester Village. To amend your booking to a different time/date once booking is confirmed, you must give at least 24 hours notice subject to availability. Guests will be picked up from the Golden Tours Visitor Centre Victoria. Those who opted for hotel pick-up are asked to wait outside their hotel for departure.